When my husband was offered a great job in a new city, we decided to pull up stakes and relocate to the west coast of the USA. Our new city is San Diego, California, located more than 3,000 miles away from our former home of Ottawa, Canada. After selling our house, contacting a mover, packing all of our worldly belongings into boxes, and driving across the continent with our dogs, the next urgent concern was finding a landlord who was willing to rent a home to a family with three large dogs. First, I needed to gauge the overall attitude of San Diegans (and especially landlords) towards pets. The Internet is a gateway to information that lets you research a wide array of topics remotely. After plugging some key words (rental housing, landlords, pet policies) into search engines, I found a web site for San Diego dog owners that lists beaches, trails, and parks that allow dogs, recommends veterinarians and pet food stores, and gives information about pet adoption resources. From this web site, it seemed possible San Diego might be somewhat accommodating toward dogs. Second, I checked out rental listings in the local newspaper to see how many ads mentioned pets. In addition to the classifieds section of the newspaper, I found two web sites that give information about rental housing in different cities: http://www.apartment.com and http://rental-housing.com/user/entryform.htm. Third, I tapped into the limitless knowledge available through the listserve E-mail group GREYHOUND-L and a Usenet message board called rec.pets.dogs.misc. Through these two forums, I was able to exchange e-mail with two San Diego dog owners who were able to provide me with additional information regarding the rental market and the chances of finding a rental house that accepts dogs. You can also contact the local Greyhound adoption organization to ask about the rental market in the city and how many Greyhound adopters are homeowners versus tenants. Finally, we signed up with a rental agency that works specifically with finding rental housing for pet owners. For a small one-time fee, the agency provided us with a list of rental properties that accepted pets. Before applying for a rental house, I prepared for the anticipated barrage of (relevant) questions about our pets and us. To improve our chances of finding a landlord who would accept our three dogs and us, I compiled a portfolio we could show to all potential landlords. The portfolio consisted of “resumes” for each of our dogs, listing their achievements and certifications. I structured these resumes just like a human resume, providing information on vital statistics (name, breed, age, and size), education (number of training classes and levels achieved), and certifications (Canine Good Citizen and therapy dog certifications). The Greyhounds even had a career history: apprentice, racer, house pet, and therapy dog! In addition to resumes, I obtained three written references from people who not only knew our dogs and us, but also had credentials themselves. The first and most obvious choice for a reference letter was the veterinarian to whom we brought our dogs for the past five years. He wrote a letter attesting to the health and good behaviour of our dogs. The second was from our next door neighbor who described what it was like to share an attached wall with three large dogs and never hearing a peep. He also described the appearance of our house and yard, noting it was well-kept and clean. The final reference letter came from the trainer from whom we took our obedience lessons. She described the levels of training our dogs received and that we are owners who have taken the time to ensure our dogs are upstanding canine citizens. To add a personal touch, we included photos of our dogs, including many of Greyhounds doing what they do best: sleeping! We also enclosed literature and brochures on Greyhounds and the Greyhound adoption movement. After applying for a few rental homes without success, it became clear there are some formidable stumbling blocks for tenants with pets. First, many rental units are managed by property management companies with strict rules about pets. These companies often place restrictions on the size and number of pets allowed. For example, many properties advertise they allow pets, but really only accept cats. The properties that do allow dogs often put restrictions on the size of dog allowed — for example, only dogs under an arbitrary weight limit, such as 35 pounds. 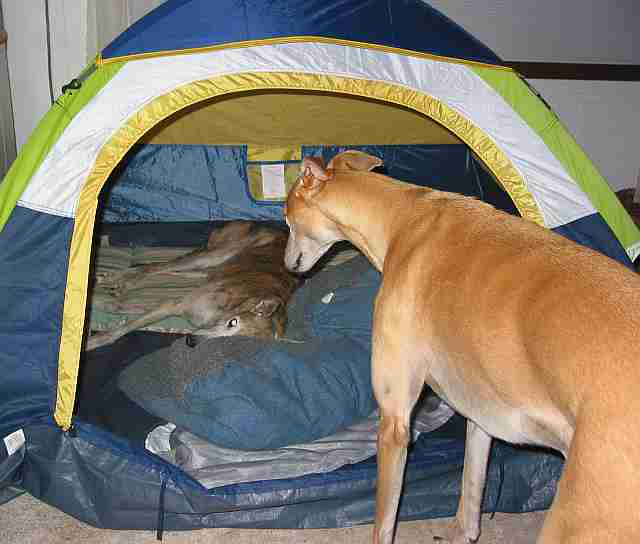 The weight limit seems unfair because Greyhounds are the near ideal canine companions: quiet, clean, and inactive. After researching this further, it seems weight limits are probably put in place for liability and insurance reasons to ensure breeds labelled as high-risk (Rottweilers and Pit Bull Terriers for example) are weeded out. If you find a property you would like to rent, ask the property management company if you can contact the landlord directly. Tell the landlord about your situation and ask if you can show him/her your portfolio. Any training you invested in your dog is sure to pay off at this point. The Canine Good Citizen and therapy dog certifications will win you bonus points because they show your dog is a well-trained and contributing member of society. You can also offer to submit a larger security deposit than is required, demonstrating you are willing to compensate for any damage that might occur. Many landlords hire property management companies because they are not in the area or are unable/unwilling to screen applicants themselves. If you can explain your situation to the landlord, you might find one willing to work with you and override the management company’s pet policies. If you are having difficulties finding a rental house, try to discover his/her reasons for not renting to pet owners. Sometimes the reasons are based on fear or misconception. If you can minimize the fear or clarify the perception, you stand a better chance of success. For example, in San Diego, fleas are a constant annoyance and can be difficult to control once an infestation occurs. To quell this fear, you can show proof that your dogs are protected from fleas by Advantage™ or Program™. If the landlord is concerned about damage, assure him or her you will use crates or ex-pens to confine your dogs to certain areas of the home (preferably in non-carpeted areas) when you are not present. If noise is a concern, discuss the fact that Greyhounds, unlike other breeds, are not known as barkers and then bring up the reasons why dogs bark incessantly. Some dogs bark because they are lonely (separation anxiety) or bored (lack of stimulation). Describe how your dogs do not fit into these categories, and supply references if necessary! As for our story, I am happy to report we were successful in our quest to find a landlord that would take us and our three dogs. It really pays to have kind, animal-loving family members in your new city who also just happen to be landlords!